So I've been very distracted these past three weeks. One child going off to her freshmen semester of college, another looking at colleges for next year and one cruising into her junior year of college. All of these people coming and going, planning, laughing, crying. And then there is the store which keeps me sane/insane through all of this. 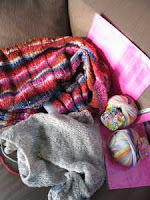 I have so many projects on the needles right now with plans of having great new samples soon! The knitting is what I do when I am home or traveling because I have taken down a wall in the store so that we may be more efficient when we are helping you. 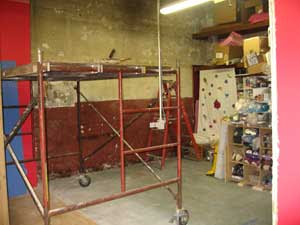 We are redesigning our check out and shipping area to start and then will be doing more. Stay tuned for updates!